This set was as I expected, however, one of the deco pillows seemed like it didn’t belong to the set. The colors were way off to me. It was the smaller pillow and I didn’t sweat it. It’s growing on me now. Good quality for the price. Mystic 7 piece coverlet set is a quilted masterpiece and comes in layers of accented patterns and colors. Each pillow is charcoal gray with a beige/gold pattern that will mystify the eyes and the bedspread is full of layers and stripes that yells elegance. The quilted pattern adds a texture depth for the visual ambiance and touch. 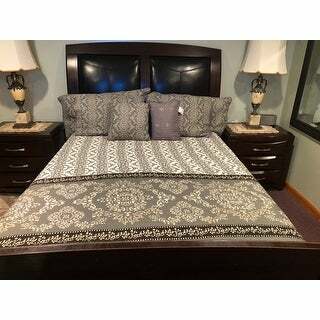 This complete bed spread set comes in seven pieces; a coverlet, two pillows shams, two Euro pillow Shams, and 2 throw pillows. Each piece is made of high quality microfiber and is soft to the touch not to mention feels great to anyone under the covers for a relaxing restful sleep. The bed in a bag is easy to care for and does not need to be dry cleaned. Machine washable on low in cold water and can be machine dried on low settings with low heat. ALL SEASONS VERSATILE USAGE! Face and Back: 100% Polyester; Filling: 100% Polyester. COMFORT MADE WITH STYLE! 2 Design Variations: Coral Chevron, Floral Medalion, and Royal Scroll. 1pc Bedspread 122" x 106", 2pc Pillow Shams 20" x 36" + 2", 2pc Euro Shams 26" x 26", 1pc Decorative Pillow 12" x 16", 1pc Decorative Pillow 16" x 16". EASY AT HOME CARE! Machine wash, separately, using cold water. Tumble dry on lowest heat setting to avoid heat damage. Your bedspread can lose its softness and texture if washed in hot water or dried using high temperatures. When properly cared for, you can enjoy your bedspread for a lifetime and expect the color to last due to in-house pre-treatment. Serenta BRAND BRILLIANCE! 100% Polyester fabric is non-shedding, snuggly, and high-quality crafted. In-house manufacturing allows us to cut the middleman and provide you with high-end products at affordable prices. You will distinguish the difference in Serenta products to others as soon as you sink your hands into the high-grade fibers, designs, and construction. This is a beautiful lightweight quilt! Its reversible, so you have 2 quilts in one. 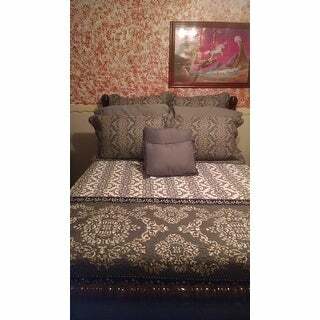 I love the euro shams and decorator pillows. It gives the bed a really full and well-dressed look! Its a great price for all the pieces you get as well...... a definite keeper! I love this Quilt Set. The quilt is well made and also just the right weight for sleeping comfort. The pillows and sham set make a great addition to the already attractive ensemble. I would recommend this product! I love this quilt! I am using the reverse side which is a solid pattern that is beautiful. I did not care for for the black and white pattern with the grey. The reverse side is gorgeous grey with light taupe color. I just ordered a throw and rug to match. The quilt is very neat looking does not ride up and bunch up. That is important to me. It is an extremely soft to touch set. You will be very pleased with this purchase!!! Great price too!!! I really liked the quilt in this set. I have had a lot of compliments on it. It is easily cleaned and hasn't faded. My only wish was that the pillow shams weren't euro sized. 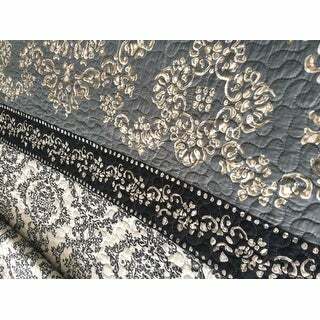 Very nice bedspread, looks nice on bed I ordered a queen size fits perfect for my bed washes nice no snags and will stay on bed not on the floor. Love it! Beautiful addition to your room! This bedding looks exactly like the photo. The quality is good and the extra shams are a plus. The colors are the same in person. The quilt is just the right weight for the warmer months. Love my purchase. Loved this lightweight quilt and that it is also reversible. It washes beautifully. I have received many compliments on it as well as wondering where I bought it. At Overstock.com, of course! Love this set. The aqua color is very soft and set has nice patterns and feel to the material. I LOVED the desgin and the color. Its for my new house and bedroom.Well made. Gave it to my daughter as a gift. She luvs the color and is going to put it on right away. It’s reversible ND she can use it differently. I purchased this quit for my master bedroom. It is pretty however it's thin. You will have to layer up! After a year and multiple washes, it is still holding up good . Very well made. Slightly smaller than I would have preferred. This is a beautiful, quality spread. I matched it with bright yellow and bright red pillows and it looks great. I love it. Would definitely recommend. Got what I paid for. Kind of cheap but I didn't pay a lot. NO WHERE WHAT I EXPECTED..IT WAS CHEAP LOOKING..
"Are there curtains to match?" I couldn't find them. However, I was able to find gray and white panels on Overstock that work very well together. "Will this fit a cal king bed?" This set is not currently available in California King size. The style and color. It also has REAL stitching instead of the glued stitching.